Wow...these memory sharing blog posts have had me all chocked up. Seriously, I can't even express how special it's been to read the posts this month and to see all of the beautiful art. So many times my mind would remember, with delight, some of the projects that have been shared again. Everyone on our team is so talented and have been such a pleasure to work with...Oh, girls, I am going to miss having this blog and viewing the stunning art. It has been such a privilege... Thank you for the very bottom of my heart!! And now...I'm excited to share some of my favorites from the past few years...Enjoy! 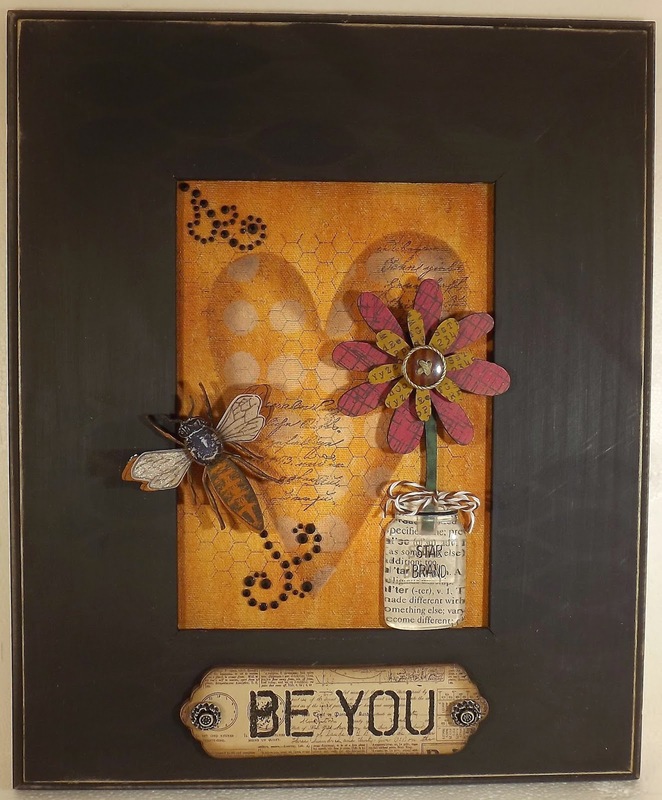 My very first attempt at Wendy Vecchi/mixed media work. Wendy was kind enough to agree to participate with us in a Make Art blog hop, just a few months after I purchased the store. That event helped to rocket me in to my exploration of all things Wendy. I have now come to love her work and sense of style. This is one of those pieces that is going to be displayed on a wall in our house...what a great memory. This book was my first real project I created using Art Anthology sprays, and I fell in love with their soft colors and the way they react with water and inks. This album contains photos of my sweet boys and so it's extra special to me. I also loved the look of Catherine Scanlon's flowers against the teal background. This was also the first time I hand bound a book! My very first art journal page...that I liked! LOL! Until this point, I had been pretty much making a hot mess and these pages had started out much the same way....and then I broke out the gesso. This was teh result of an evening spend trying to embrace my own style vs. re-creating another artist's style. This layout will always put a smile on my face. Using class samples to create mini art journal pages...fun, fun, fun! I have 15 or more of these pages and about half of them are already finished. I can't wait to bind them all together in to one book. I love this face stamp from Wendy Vecchi...love, love, love it! I created this tag to demonstrate a technique to one of our customers...and that makes me happy. Helping customers discover the joys of creating and experimenting with products is the absolute best part of this job. I drew a face! Need I say more! This was from a Tamara Laporte class (this is definitely her style), but I never would have known who Tam was or any other mixed media artists if it wasn't for eP and I am so grateful for getting to have the amazing experience of learning how to draw, shade, color, etc. What a treat! Gelli plates! The most fun ever was creating 30 journal pages in a Catherine Scanlon class. I've finished a few of those 30 pages, but this continues to be my favorite layout and it's so me...script, a circle, and a face...what more do you need? Can I open and end with a Wendy piece? Of course I can! This is the front of my stamp storage binder that I created from scraps that were sitting on my studio table. I love little houses and I was so excited about the final results. Well, friends, there is so much more I could share, but I'm going to sign off for now and send along my very biggest and heart felt thank you!! This has been a most amazing journey!! Beautiful work, Kim. I will miss this blog. Good luck. I will miss your blog too; see you on Facebook!! What wonderful projects Kim - I'm sure going to miss being on this creative team - and getting to know you a little better - I wish you the best in your future endeavors! LOVE them all! Wish I could have taken classes at your store in real life! Thank you so much again for having me on your eP team. It was the BEST creative experience of my life!